This is the first ever game between these two sides but the most pressing aspect on Friday night is who will grab the win. This is because both of the teams lost out in the opening round of the season, and no wants to lose their first two games in the Euroleague. However, it would be a massive shock if the Catalan club didn’t triumph in this game. They haven’t lost to a Polish team since 1960 and in this time, they have managed to win 16 games against Polish opponents. Barcelona have never lost their opening two games of a Euroleague season and they will be in no mood to start this season. With players like Ante Tomic, Justin Doellman and Stratos Perperoglou, you have to say that the hosts look to have too much firepower for Gora to contend with. If Barcelona have the right attitude, this could be a high scoring night. Stelemt may not have too much experience as a team in the Euroleague but they do have plenty of players with considerable experience and expertise. Karol Gruszecki, J.R. Reynolds, Lukasz Koszarek and Dee Bost all have a few tricks up their sleeve. If all of these players click and hold the line well, this may not be the walkover that many people, including the bookmakers, think but it definitely looks like being a tough start to the weekend for the Polish side. However, you can’t fully rule them out, no matter how much the history book tells you to go with the home side. 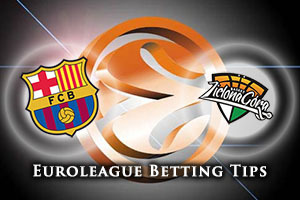 There’s not a lot of value to be found in Barcelona so choose Stelemt Zielona Gora with a +20 handicap, which is coming in at odds of 1.90. When it comes to the Over/Under market for this match, you should find that going OVER 150.5, which is available at odds of 1.90, is likely to be a decent bet for anyone wanting a thrilling basketball bet. Bet Now!